On October 10th, California Governor Jerry Brown signed AB 477 into law, placing a Green Party section into the California state Elections Code for the first time. Previously the Green Party operated under the elelections code of the Peace & Freedom Party. Under state law, when a political party qualifies for the ballot in California, it must choose to operate under the Elections Code of another ballot qualified party, until it can get its own section approved by the legislature and signed into law. When it qualified for the ballot in 1992, the GPCA chose the elections code of the Peace & Freedom Party. The Elections Code for each party addresses two topics: Presidential Primaries and Party structure. In the new Green Party section for Presidential Primaries, the process for designating delegates to the Green Party national presidential convention would not be placed in the Elections Code, as it has been for the Peace & Freedom Party. Instead the Code would reference the GPCA's Bylaws and its Rules and Procedures as the source. This would give the the GPCA greater freedom to make future amendments, without having to return to the legislature. 6863. The number of delegates to be selected following the presidential preference primary shall be the number established by the national political party with which the Green Party is affiliated. 6864. In each year of the general election at which electors of President and Vice President of the United States are to be chosen, the Green Party shall also nominate as the candidates of its party as many electors of President and Vice President of the United States as the state is then entitled, 50 percent of whom shall be women and 50 percent men, unless an odd number of electors is to be chosen, in which case the difference between the number of women and men shall be not more than one elector. For party structure, existing law authorizes the Democratic Party, the Republican Party, the American Independent Party, and the Peace and Freedom Party to each elect county central committees. Existing law also establishes state central committees for each of these parties as well. What other parties call county central commitees, the Green Party calls "County Councils", and this is reflected in the code. The governing body of the party on the county level, County Councils are elected by registered Greens in the presidential primary every four years. A maximum and minimum number of seats per County Council district has been placed in the Elections Code to guarantee that the GPCA could not decide to place a large, unreasonable number of seats on the ballot. Otherwise within this range, the number of seats in each county would be established in the GPCA bylaws, again giving the party flexiblity without having to return to the legislature. The Elections Code also provides a range of sub-county districts from which local County Councils could choose to conduct their election - especially applicable in the more populated counties. To make it easier to gain the required number of nomination signatures to run for County Council, this clause allows a petition to include as many candidates as there are available seats, rather than having to have separate petitions for each candidate. An interesting aspect is the ability to appoint non-citizens to County Councils. 7905. ...Appointment of other persons who cannot register to vote shall be allowed under certain circumstances as described in state Green Party bylaws and any applicable county Green Party bylaws. The role of the state party's Coordinating Committee, an integral part of the GPCA since 1990, is also esconced into the elections code section. 7924. The members of the state coordinating committee shall be elected as provided in the Green Party bylaws and shall have the responsibilities described in those bylaws. 7927. (a) The state coordinating committee shall have the authority to certify, as provided by Green Party bylaws, county council members in the following counties: (1) Counties where no county council candidates qualified for the ballot in the preceding presidential primary election. ; and (2) Counties where all members of the county council have become disqualified from holding office. 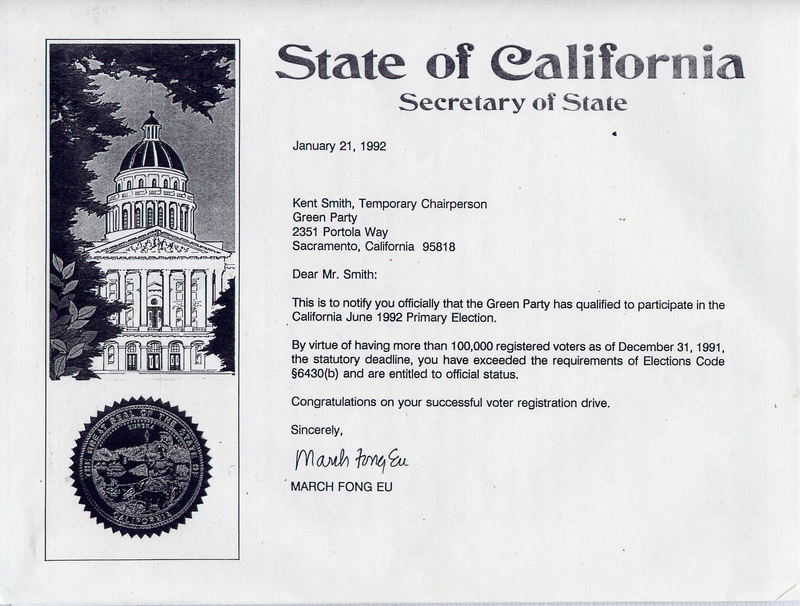 When the Green Party of California (GPCA) qualified for the ballot in January 1992, it chose the elections code of the Peace & Freedom Party. At the same time it also won the right in the courts to have None of the Above (NOTA) in its party primaries, along other electoral reforms that sought to embody Green values in the electoral process and the party's structure (www.cagreens.org/history/election-rules-1992-1995). However the GPCA lost NOTA upon appeal in 1995 in Green Party v. Jones (www.cagreens.org/history/nota/gpca-v-jones). Today's GPCA elections code grew out of a internal GPCA drafting process between 1999 and 2006 (www.cagreens.org/elections-code). Afterwards the GPCA was not able to find a legislative sponsor for the bill for some time, because the draft Green Party text contained sections mandating the use of ranked choice voting and none of the above in party primary and county council elections. These sections made it unlikely for a legislator to sponsor, because if it were allowed for the Green Party it could be allowed for the other ballot qualified parties, and that was a controversy for those parties no legislator was interested in initiating. Then with ranked choice voting, there was no statewide equipment certified to run ranked choice voting elections, and a section of the code would not be written without the ability for it to be carried out in practice. After consultations with staff from the State Assembly Elections Committee and Speaker's Office of Member Services, a draft text without controversial context was created and approved by the GPCA's General Assembly in May 2012. That text was resubmitted to the State Senate Elections Committee in 2015, where it ultimately became part of AB 477. The GPCA expresses its great thanks to Senator Kevin Mullin for adding the Green Party Elections Code section to his bill AB 477, to Senator Ben Allen for his support as State Senate Elections Committee chair, and to all the committee staff members who helped make this happen.